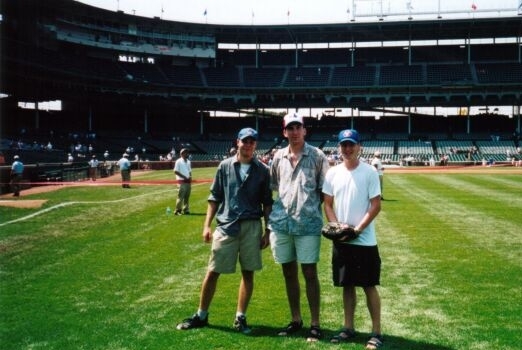 In 2002, the Mop-Up Duty trio of myself, Early and Matthias took a road trip to Chicago to bask in the friendly confines of Wrigley Field. Although my memory of the experience is a little hazy, the key points of the ballpark are still vivid in my mind. Built with the intention of being the home to the Federal League’s Chicago Whales, Wrigley Field was constructed in only six weeks at a cost of $250,000 in 1914. The stadium did not become become home to the Chicago Cubs until two years later, in 1916. After undergoing modifications over the next two decades, Wrigley Field is basically unchanged since renovations completed in 1938. To be honest, it really does look like nothing has changed since then. With its ivy-covered brick walls along the outfield, the “Friendly Confines” of Chicago’s north side has always been one of the most recognizable ballparks in all of Major League Baseball. Wrigley Field is the second-oldest ballpark in Major League Baseball (behind Fenway Park) and seats 41,160 patrons. Located at 1060 West Addison Street, Wrigley Field is situated in the north Chicago neighbourhood of Lakeview, an eclectc community that contains residential streets, bars and businesses. This neighbourhood is lovingly referred to as “Wrigleyville.” This area is a baseball fan’s dream – sports themed bars and Chicago Cubs retail stores line the streets surrounding Wrigley. Those who enjoy a good party-zone will want to visit The Cubby Bear and Murphy’s Bleachers. We hit up a few more bars but I can’t remember the names of them 10 years after the fact. In general, the vibe to these bars are all pretty much the same – stand, drink beer, talk baseball, heckle, get heckled, repeat. Historians will take particular interest in the Billy Goat Tavern, home of the legendary Curse of the Billy Goat. The curse of the Billy Goat was supposedly placed on the Chicago Cubs in 1945 when Billy Goat Tavern owner Billy Sianis was asked to leave a World Series game vs. Detroit Tigers because his pet goat’s odor was bothering other fans. He was outraged and declared “Them Cubs, they aren’t gonna win no more,” which has been interpreted to mean that there would never be another World Series game won at Wrigley Field. 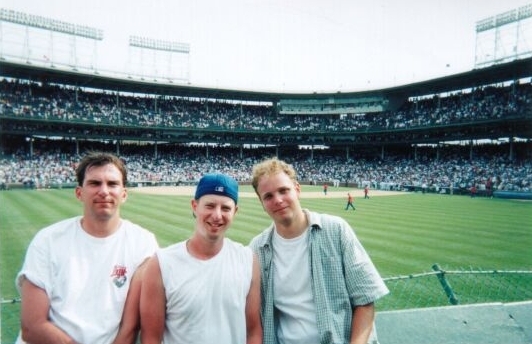 When we visited Wrigley, the north side of Chicago was deep in the throes of Prior fever. Former pitching stud Mark Prior had just joined the team and he was slicing through NL bats like a knife through hot butter. In short, he was the Cubs’ saviour that would slay the curse of the Billy Goat. Prior merchandise was on sale everywhere in Wrigleyville. In some places it seemed like Prior jerseys and shirseys were the only items for sale. That said, Chicago Cubs merchandise is plentiful in all shapes and forms. Buyer beware: not all Cubs merchandise sold in Wrigleyville is necessarily licensed my Major League Baseball. 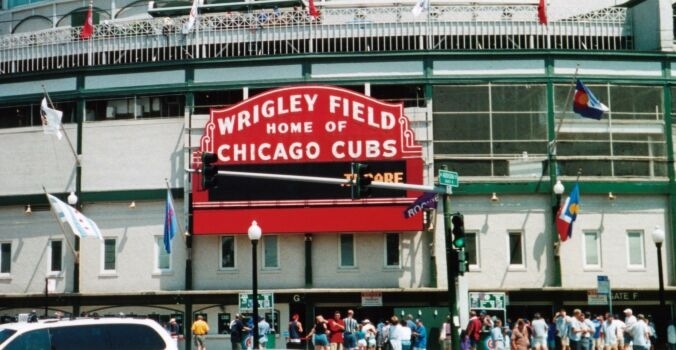 Directly above the main entrance to the stadium stands the most familiar icon of the exterior of the ballpark, a large red, art deco style marquee, painted in white letters to read “Wrigley Field, Home of Chicago Cubs”. The marquee – originally blue – was installed in 1934 and remained blue until it was painted red in the early 1960s. The marquee is so iconic with the park that even the Chicago Transit Authority platform that services Wrigley Field (the Addison St. station) has an image of the marquee painted on a wall announcing the destination, rather than simply marking it with black block letters consistent with other stations. Moving on to the ballpark itself. When we first got inside, we toured around the different levels and ended up at the upper deck. From that vantage point, one can clearly see how much of a rickety old ballpark it really is. 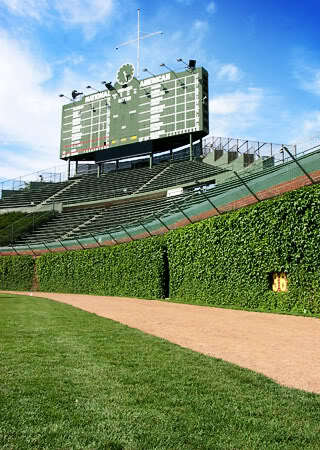 Apart from the ivy covered brick outfield wall, Wrigley Field is known for the unusual wind patterns that blow in off Lake Michigan, the iconic red marquee over the main entrance, the manually-operated scoreboard, and for being the last major league park to get lights (in 1988). Today, Wrigley Field is the last Federal League ballpark standing. Even with lights, Wrigley Field remains one of baseball’s most old-fashioned parks. In regards to the scoreboard, Wrigley is one of the last parks (along with Fenway Park) to maintain a manually-operated scoreboard. Unlike the home of the Red Sox, the scoreboard at Wrigley is mounted above the center field bleachers, rather than at ground level, making it harder to hit during play. No players have hit the current scoreboard. The scoreboard was installed in 1937, when then-Cubs owner Bill Veeck installed new bleachers. The scoreboard has remained in place ever since, and has only seen minor modifications. The clock was added in 1941, a fifth row of scores was added to each side in 1961 and later a sixth. An electronic message board was also added below the scoreboard. As well, flags atop the scoreboard alert fans as to whether or not the Cubs won the day before, and where the Cubs are positioned in the standings – a feature copied at Baltimore’s Oriole Park at Camden Yards. Unbeknownst to most fans, once a year the Chicago Cubs allow baseball fans on to the field to mingle with players, coaches, and pretend what it would be like to play in the outfield of Wrigley. The team does not announce which date it will be, and the date is picked at random. 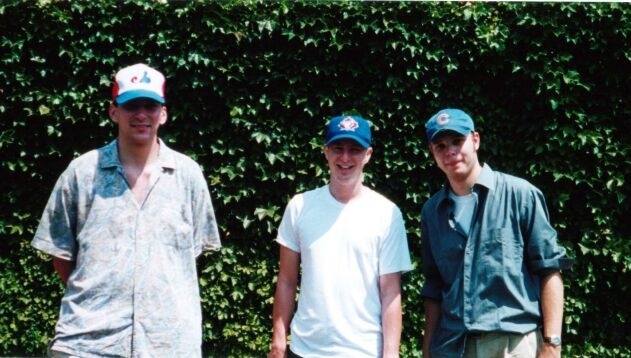 Lucky for us, we arrived on that day – August 3, 2002. 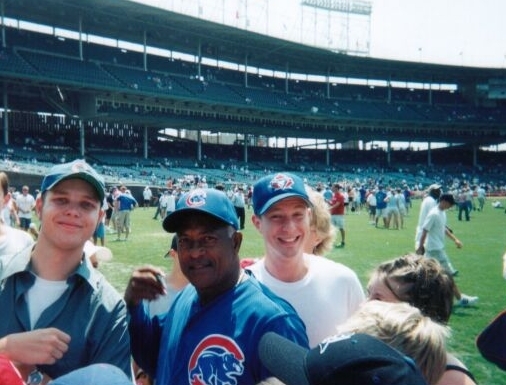 We were able to roll around in the grass, pretend to catch fly balls and meet some Cubs players like Carlos Zambrano, Joe Borowski and even the legendary coach Sandy Alomar Sr. This was awesome. When we got to our seats, we found ourselves on the lower-level on the first-base side, more or less sitting behind a support beam. Buyer beware – stay away from obstructed view seats. 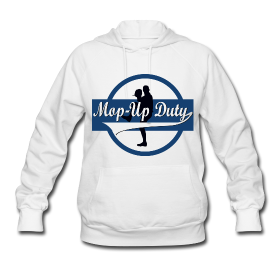 One of the things I like to talk about when reviewing a ballpark is fan etiquette – general baseball knowledge of the fan base and overall courteousness. Toronto probably sets the standard when it comes to etiquette. For instance, at the SkyDome, fans will never get up and walk across rows during play. Fans will only move during breaks in play and between innings. No such luck at Wrigley. It’s drunken mayhem with total disregard for the actual game that is being played. Fans scream enthusiastically – for more beer – and are up and down the aisles and rows at will. As Earl was apt to say (over and over and over again during the trip) people only go to Cubs games because it is the “trendy” thing to do. 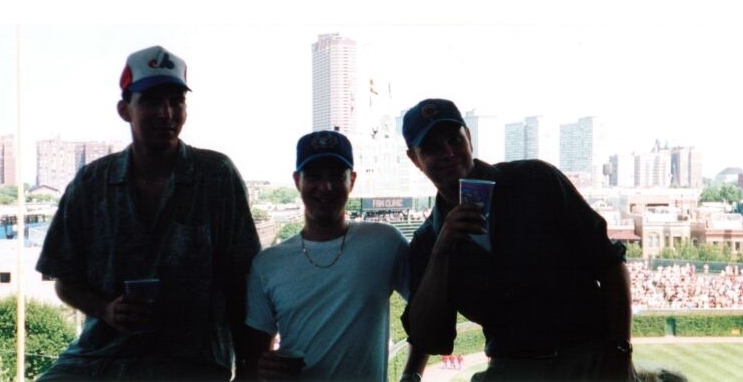 The following day we sat in the bleacher section over the outfield fence. Even though the distances to the right and left field corners are above average, Wrigley’s peculiar bleacher configuration makes for rather short distances in the power alleys. Depending on the wind (which can blow hard either in from Lake Michigan or out toward it), this can be a very friendly place for power hitters such as Sammy Sosa. Earl, Callum and Matthias. Don’t forget to bring sunscreen. 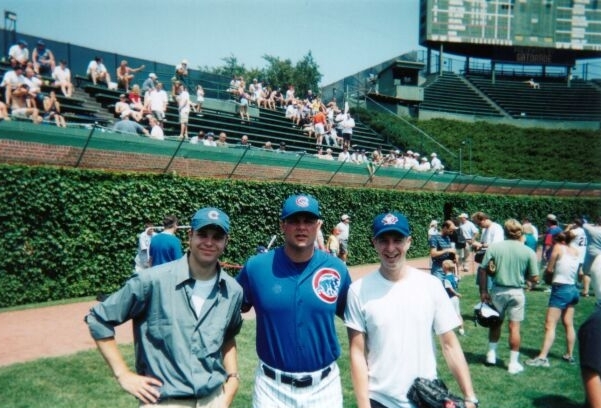 It worked out to my benefit as well, as I was able to nab a Sammy Sosa batting practice HR as we all camped above the ivy in the right-field power alley. Seats in the bleacher section are parceled out on a first-come, first-served basis – at least when we were there. The park opens 2 hours before game time for those eager to secure a spot. In the bleachers you will find even more of a concentration of frat-trash fans than in the rest of the ballpark. As well, there is a “rivalry” between fans in the RF bleachers and the LF bleachers. Street vendors sell shirts that capitalize on this fact. All 3 of us suckers bought one. I still have mine. The bleachers are a great place to watch the game and a must-see for first-time visitors to the park. The only thing lacking is that beer vendors do not sell beer in the seats – patrons have to get up off their asses and get them from the concourse. Looking back, however, it is probably for everyone’s benefit. Overall, Wrigley Field is a middle-of-the-pack ballpark. It’s great from a nostalgia/historic perspective, and while the neighbourhood is a great deal of fun, the ballpark is either a dirty relic or a historical icon based on your perspective. For additional ballpark reviews and to see how Wrigley stacks up against others, make sure to check out our Ballpark Review Roundup. Next articleWho Had The Better Slider: Dave Stieb or Steve Carlton?